We are very sad to report that Sakthi Meenakshi, the mother of Bangaru Adigalar has passed away. 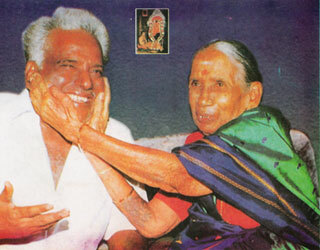 Sakthi Meenakshi was married to Sakthi Gopal Naikar who passed away in 1999. They had three children: A son, Sakthi Kalidasan, a daughter, Sakthi VaraLakshmi, and our beloved Guru, Bangaru Adigalar. She was a loving and sensitive person and will be greatly missed by all who had the privilege to know her. She and her husband provided the inital financial support to establish the Adhiparasakthi Trust. The temple is situated on land they donated to the trust.